At Divorce Resolution Advisors, we work with couples to understand current marital standard of living and help spouses create a roadmap for an equitable division of assets and support for dependents. 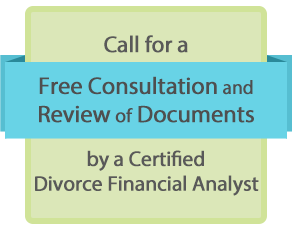 Let our divorce financial analysts help you work toward financial solutions, set priorities and gently guide you through the tough choices ahead. A divorce financial analyst is equipped with all the necessary tools to handle monetary considerations involved in the divorce process. Whether you need a review of your attorney's recommendation or are in the early stages of divorce, we can guide you through the financial aspects and help create a plan for an equitable division of of your financial assets and establish a spousal and dependent support plan. Contact us today. Divorce Resolution Advisors in San Francisco, California, provides divorce financial planning and analysis. Our divorce financial analyst work with family law attorneys, mediators and tax professionals to address financial related matters and provide couples with guidance and financial solutions necessary necessary to make informed decisions as they move through the divorce process. With more than 25 years of financial expertise, we are committed to assisting clients with creating a plan for marital division of assets, support for spouses and minors/children (both baseline and upward mobility that benefits the dependents). Additionally, we have experience with determining the value of stock options and restricted stock units for fair distribution to the spouse not holding these assets. The group's principal divorce financial analyst is Henry 'Hank' Korngut, aided by Julie Kronberg who works together with him on cases. Hank is a Certified Divorce Financial Analyst™ (CDFA) who helps clients through the financial aspects of divorce. Call us today in San Francisco, California, for divorce resolution advice from a divorce financial analyst.